Haven’t some of us known persons with that same gift? I can attest to the truth of this. And so: what of this book as a whole? My verdict is decidedly mixed. I liked the basic plot premise: it is a tale of two families, one living in the here and now, the other in the 1870s. They inhabit the same town, Vineland, in southern New Jersey. In fact, they live in the same house. Then, as now, it’s a domicile enlivened by plenty of turmoil. Now ordinarily I love novels that feature lots of family infighting. Done right, they can seem very true to life, at times, even funny, in a savage sort of way. But the characters in the contemporary part of the story tend to speak at rather than to each other, as if they were delivering campaign orations on everything from the inequities of capitalism to the crisis of the environment. I was okay with this at first, but it happened often enough that it got on my nerves. Dinnertime conversation consisted mainly of polemics. It got so that I longed to hear just one small voice venture, even tentatively, to ask if somebody would please pass the potatoes. Unbustled and unbonneted like this, Rose was a gravitational body that drew his front against her back, his bearded jaw against her tiny zenith. Their perfect fit sent a whiskey thrill through his veins. After six months of marriage he was still in thrall of his wife’s physical properties, and wondered whether this made him a lucky man or a doomed one. Alas, for my money, there was not nearly enough of this gently undulant prose. When I read fiction, I don’t want to be harangued about competing ideologies. At least, not to the exclusion of real flesh and blood characters. 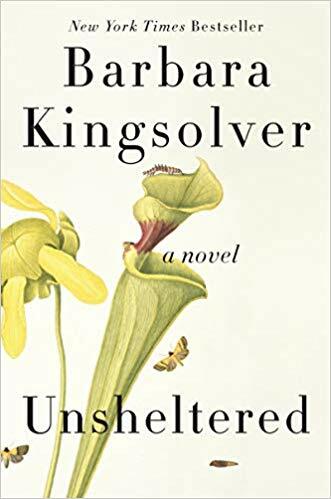 I do like the way Kingsolver sneaks in brief, pithy truisms like the ones I’ve quoted above. But I found the characterizations thin, almost to the point of caricature. The story of the modern family is told mainly through the viewpoint of Willa, whom I found somewhat obtuse and not particularly sympathetic. If Vineland is supposed to be a microcosm of the United States in 2016, then the house is an excuse for Kingsolver to cram five people with disparate political allegiances under one leaky roof. Family dinners are exhausting opportunities to rehearse the major fault lines in mainstream American politics. Willa wonders why it seems like “there’s less money in the world than there used to be.” Iano bemoans his lack of job security, blaming his failed tenure bids on jealous colleagues and rumors of affairs with students. “Boundaries, everybody keeps saying this word and I never get it,” he complains. Zeke and Tig bicker about finance capital and ecocide, volleying clichés at each other while Willa watches, bemused, and Iano submits clarifying comments. “Grow or die, that’s just the law of our economy, Tiggo,” Zeke says. “There’s no more room to grow,” Tig snaps back. “Supply and demand,” offers Iano, who we are supposed to believe has a doctorate in global politics. Nick mutters racist epithets and rails against Obamacare. The baby puts things in his mouth and cries. This is the American-family novel as Sunday-morning talk show—a character drama with no real characters, only sound bites masquerading as human beings. I only lasted for 46 pages, and it sounds like I made the right choice. The things you criticized were precisely the things that made me annoyed enough to stop reading. The Poisonwood Bible it isn’t!